Heena Sidhu claimed gold for India on the 2018 Commonwealth Games shooting range when she fought off a challenge from local shooter Elena Galiabovitch to win the women's 25-metre pistol event at Gold Coast, Australia on Tuesday. With this gold medal, India's tally went up to 11 golds at 2018 CWG. Heena proved to be better than Galiabovitch as she kept her poise to clinch the gold with a Commonwealth Games record with a total score of 38. This was Heena's second medal at the Games, after her silver in the women's 10m air pistol behind Manu Bhaker. Heena was in joint second position after Round 2 while compatriot Annu Raj Singh was lower down the rung at joint 5th. However, while Heena managed to stay in the leading group after Series 4, Annu Raj Singh fell to 7th. After Series 6, Heena was in joint gold medal position while Annu Raj Singh was eliminated. After Series 7, Heena was on top, ahead of the second-placed Australian by 2 shots. "I am exhausted, those are my thoughts on today's performance," Heena said while speaking to PTI after her gold. Annu Raj Singh finished sixth after being eliminated in the second stage of the same event. Her final score was a disappointing 15. Heena, however, was in terrific form after qualifying third with a score of 579 despite admitting to struggling with her trigger finger owing to a nerve problem. "Thankfully, my trigger which has been giving me some trouble because of a tingling sensation was alright today. I didn't feel that tingling too much," Heena said. "The 10m air pistol final is a blur to me, I couldn't feel my fingers during that. I have been undergoing physiotherapy for this problem but for today, I told my physio not to touch me. I just let it be and to my relief it went off well," she said. Heena meanwhile, started slowly before climbing up the standings with an awesome show in the Rapid round. She was decidedly below par in the Precision round and was lagging at the seventh spot with 286. Heena struggled with her opening couple of shots in the Precision round with disappointing efforts of 95 and 93 before recovering somewhat with a 98 in her third and last attempt. Heena started the Rapid round poorly as well as she could only manage a 95 in her opening attempt. But she saved her best for her last two shots, firing consecutive scores of 99 to zoom to the third spot. Heena Sidhu (born 29 August 1989) is an Indian sport shooter. On 7 April 2014, Sidhu became the first Indian pistol shooter to reach number one in world rankings by the International Shooting Sport Federation. 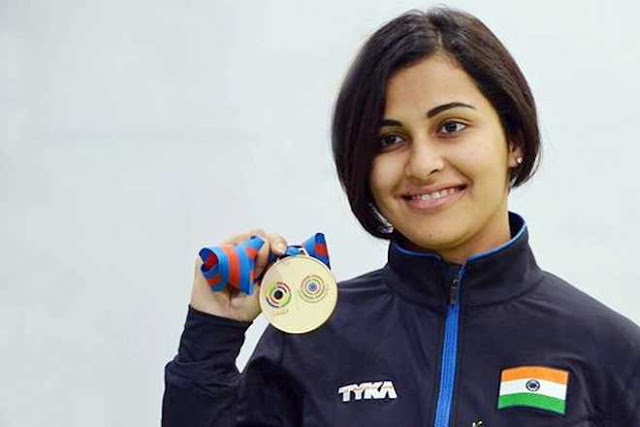 In 2013, Sidhu became the first Indian pistol shooter to win a gold medal in an ISSF World Cup finals when she won the 10 metre air pistol event. In 2014, Sidhu was the World record holder in the 10 metre air pistol event with a final score of 203.8. Sidhu is right handed and is right eye dominant. Personal life In 2013, Sidhu received a Bachelor of Dental Surgery. Sidhu's father was a national sports shooter. Her brother is also a shooter in the 10 metre air pistol event. Sidhu's uncle is a gunsmith and gun customizer. On 7 February 2013, Sidhu married Ronak Pandit, also a pistol shooter. Sidhu resides in Goregaon, Mumbai. Career Sidhu began shooting in 2006, participating in the national junior and senior teams. She was a member of the Patiala Club. In 2009, Sidhu won a silver medal at the ISSF World Cup in Beijing.. She won first place in the women's 10 m air pistol event at the national championship in Kerala. Sidhu, with Annu Raj Singh and Sonia Rai, won a silver medal in the Women's 10m air pistol team event at the 2010 Asian Games in Guangzhou, China. With Annu Raj Singh on 375 points and Sidhu on 384 points, Sidhu and Singh won a gold medal in the women's pairs 10 metre air pistol at the 2010 Commonwealth Games. In the singles event, Sidhu won a silver medal. Sidhu was a member of the Indian team to the 2012 Summer Olympics in London. She competed in the women's 10 metre air pistol event, finishing twelfth in the qualification round. Sidhu was part of the official London Olympic Games film entitled First: The Story of the London 2012 Olympic Games. The film, written, produced and directed by Caroline Rowland followed a dozen first-time Olympic athletes as they prepared to compete in London. In 2013, Sidhu won the gold medal at the ISSF World Cup Finals in Munich, Germany. Sidhu defeated the world champion Zorana Arunovic of Serbia and the previous winner, Olena Kostevych of Ukraine with 203.8 points, which gave her a 5 point lead at the end of the event. In the 2014 Indian National Shooting trials, Sidhu won by 0.1 point over Rahi Sarnobat in the women’s air pistol event. In 2016, Sidhu qualified for the 2016 Summer Olympics in Rio de Janeiro in the women's 10 metre air pistol and the women's 25 metre pistol events. Awards On 28 August 2014, Sidhu was conferred the Arjuna Award.